Age III wonders have a one-time effect that is resolved as soon as they are completed. You score a certain number of culture points based on your other cards and workers in play. Air forces are a new type of military unit that appear only in age III. An air force unit contributes its strength to your strength rating, like any other military unit. No tactic requires air forces, but an air force unit can join any army to double its tactical strength. Each air force unit can be assigned to at most one army. All these units contribute to your strength rating. 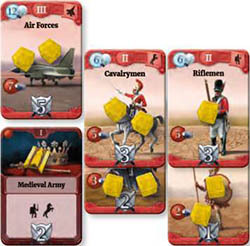 In addition, your tactic allows you to form three armies. Normally, an army's tactical strength is +2, but two of them also get air force units, which doubles their strength to +4. All together, the armies contribute a tactical strength of +10. The Conquistadors tactic is even better. You form two armies. One of these has a warrior unit, so it is outdated. Each army gets an air force, which doubles its tactical strength. The outdated one gives you +6. The other one gives you +10. Together they contribute +16 to your strength rating, in addition to the total strength of your individual units. If you switch to Shock Troops, it would not be better than Conquistadors. You now have only one army. It has an Age I unit, so it is outdated. Even with an air force unit to double its strength, it has tactical strength of only +12. The other air force unit will be not in any army (but it still contributes 5 to your strength rating, just like the one in an army). On the other hand, if you upgraded one of those knights, the army would no longer be outdated. You would get +22 from one army! You play the full game with all the military cards. The decks now include aggressions, wars, and pacts. These give you new options in your Politics Phase. You also have the option to resign if you are losing badly. The full rules for playing these cards can be found on page 4 of the Code of Laws. Wars are resolved one round after they are played, as explained on page 3 of the Code of Laws. Now that you understand the rest of the game, you should have no trouble understanding those rules. Here, we will give you only a brief overview. Military is an important part of the game. It is difficult to win the game purely through military strength, but it is very possible to lose the game if you ignore it. Even if the players are not very aggressive, the strongest civilizations will benefit and the weakest will suffer from strength-related events. To come out ahead, it is enough to make your civilization slightly stronger than the others each turn. If another player becomes significantly stronger than you, he or she may play an aggression against you. Aggressions are played as political actions. The attacker must also spend some military actions. To defend, you must match or exceed the attacker's strength by playing temporary bonuses from your hand. A military bonus card will add its defense value (depicted in the upper half of the card) to your strength. You may also discard any military card face down for an additional +1 bonus. The number of cards played or discarded this way cannot exceed the total number of red tokens you have. If you can't match or exceed the attacker's strength (of if you decide not to) then the aggression is successful. Usually, the attacker steals or destroys something that belongs to your civilization. Try not to fall too far behind in strength, especially if you don't have bonus cards to defend against aggressions. And conversely, if you get far ahead of an opponent, it might be a good idea to attack. Tip: Civilizations are especially vulnerable after they colonize a territory, as they have just sacrificed military units and possibly spent bonus cards. Maybe you get tired of continuing the arms race. You fall so far behind that not even bonus cards can save you, and you decide that being vulnerable to aggressions is the price you have to pay for focusing on more civilized pursuits. Maybe this is a good strategy, or maybe you are just inviting a declaration of war. A player declares war during his or her Politics Phase, but it is not resolved immediately. Both players have one turn to increase their strength, although the player who declared war has already spent military actions on the declaration and might not have many left. The war will be resolved at the beginning of the attacker's next turn. Neither player gets a strength bonus from playing bonus cards or discarding military cards. Only the cards already on the table count. In a war, either side can be the victor and inflict the penalties on the defeated civilization. (In an aggression, if the attacker does not win, the card has no effect). The severity of the penalties depends on the difference between the two sides' strengths. (It doesn't matter whether you lose an aggression by 5 or by 20. In a war, it really matters). Thus, ignoring your military completely may not pay off because other players may declare wars against you. Conversely, if you see other players falling far behind in strength, you might consider declaring war. But be cautious. A civilization with a strong economy may be able to significantly improve its strength rating in one turn. You don't want to lose the war you declared. Pacts are used only in a 3- or 4-player game. In a 2-player game, remove them from the military decks before the game starts. Pacts add a little diplomacy and cooperation to the game. As your political action, you may offer a pact to another player. That player may accept or refuse it. If the player accepts, the pact takes effect and remains in play. If the player refuses, the pact is returned to your hand. This ends your Politics Phase, but you can try again later. Note: You should not circumvent this rule by discussing the pact before you offer it. You can be a party to more than one pact, but you can have only one pact in your play area. If you offer a new pact and the player accepts, any pact in your play area is automatically cancelled. You can also use your political action to cancel any pact to which you are a party. Pacts also leave play automatically if they become antiquated at the end of an age (just as leaders and unfinished wonders do). Some pacts are symmetric, and both players benefit. But this benefit may be double-edged. It's nice to have an open border with another civilization until they decide to attack you. It's nice to cooperate on scientific research until the other civilization spends all your science points. Some pacts may be slightly asymmetric, but complementary. You just need to find a partner who is lacking what you have to offer. Other pacts are strongly asymmetric, where one player offers something to another in exchange for peace or protection. If you are weak, you may offer such a pact to encourage a stronger civilization to leave you alone. On the other hand, if you are strong, you might be able to use such a pact to extort a benefit from a weaker civilization. When you offer an asymmetric pact, you state who will be which side. The other player can take the offer or leave it. Note: Unless a pact specifically says so, it does not prevent the parties from attacking each other. And unless it says otherwise, the pact remains in effect after the attack. You can mark the extra production from certain pacts by placing a red token from the box on an Age A farm or mine. You can use this trick to mark extra production from other cards, too, such as Transcontinental Railroad. catch up, you may find yourself falling further behind every turn, an easy target for every aggression, war, and negative event until the end of the game. Of course, the game can still be fun even when you are losing. You will not be forced to quit. But it is possible to honorably resign. You admit you lost the game and you let the others compare their strength against each other, rather than compete to see who can harvest more from your weakness. You resign as your political action. Any wars declared against you are cancelled (but they bring some culture points to the players who declared them, as history will remember who made you resign). Your civilization and all its cards are removed from play. If there are two or three players remaining, the game continues as a two- or three-player game. If only one player remains, that player has won. But most of the time, the game should end with everyone still in it, ready for the final scoring. As with your first game, the full game ends when the player to the right of the starting player finishes his or her last turn. The final scoring list from the first game does not apply here. Instead, only some aspects of your civilization will be scored. Players decide the final scoring during play by preparing Age III events. At the end of the game, take all Age III events remaining in the current and future events decks and evaluate them one by one. Order is not important. Note: Events from older ages have no effect on final scoring. Each Age III event describes a way for civilizations to score culture points. Age III events may be revealed and resolved during play. Any still remaining in the current or future events decks are evaluated at the end of the game. When you prepare an Age III event, you are guaranteed that it will be evaluated. Most Age III events award each civilization a certain number of culture points based on the cards and workers it has in play. Some Age III events give players points based on their relative order in a certain statistic. On Impact of Science, for example, the notation "14/7/0" means that the player with the highest science rating scores 14 and the player with the second highest scores 7 . The third player scores nothing. The usual tie- breaker applies: The player whose turn it is, or the player closer to that player in play order, wins the tie. During final scoring, break these ties as though it were the starting player's turn. This is an advantage, but a player who plays later has the advantage of knowing the final statistics of those who finished the game earlier. After evaluating all the Age III events that were prepared, the scores are final. Whoever has the most culture points wins the game. In case of a tie, the tied players share the victory. But what's most important is that every player got a chance to tell the unique story of his or her civilization.